Chihuahua & Small Dog Rescue, Inc., has partnered with Give Back America. This is a great way to have funds donated to us as you shop at your favorite stores and it doesn’t cost you anything other than what you were going to purchase any way. Just install the Give Back America tool bar, pick Chihuahua & Small Dog Rescue as your charity and as long you shop your stores by using the tool bar CSDR will get a percentage of purchase. Just click on the picture below. Chihuahua & Small Dog Rescue, Inc., will receive a penny for every search you do! 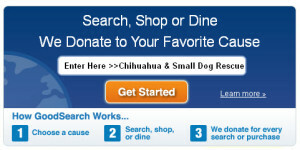 Click on GoodSearch above and type in Chihuahua & Small Dog Rescue as your charity. You can also shop online with GoodSearch where a portion of each sale will come to Chihuahua & Small Dog Rescue, Inc. All money received through GoodSearch will go to the medical care of our little ones. We hope you will help support our organization by ordering or renewing your favorite magazine subscriptions online and sharing our site with your friends and relatives. All proceeds will go to the medical costs of our furry friends. We appreciate your support. Please click on the following link, www.magfundraising.com/chihuahuasmalldogrescue, which will take you directly to where you can order or renew your subscriptions.